bryan – Page 17 – Live MoHo! We went through a VERY intense rain and windstorm. We left the slides out to see if there were leaks. I don’t want to ruin the suspense, but for those of you who read the last page of the book first (or who didn’t see my post yesterday), here comes the big reveal. There were leaks. The galley slide on the drivers side had a cabinet that was completely soaked, and it leaked down onto the sofa and the carpet underneath. 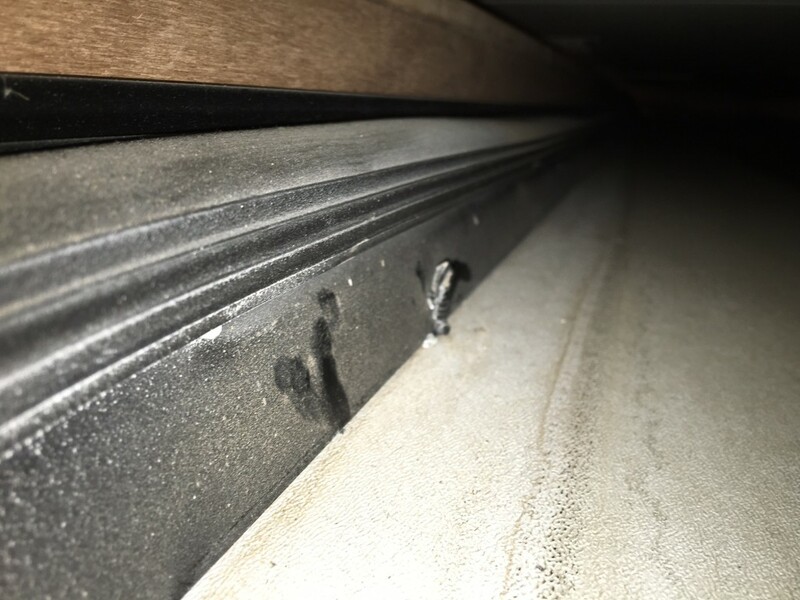 Water had pooled on top of the slide out and found an opening somewhere, at which point it came into the cabinet where the screws for the woodwork penetrated the vinyl ceiling. 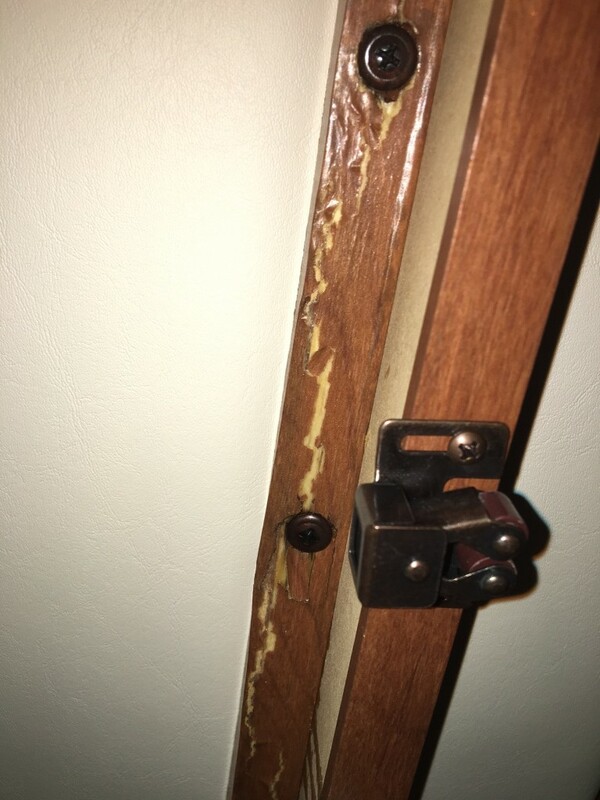 Worse, it appears that this has been happening for a while because the cabinet inside is damaged. So this got me started looking at the other slides. and I found the waterproof membrane on the rear bedroom slide – which fortunately stayed dry – was installed completely wrong. That part on the left that is sticking up should be tucked like the right side. This is crazy! The person who built that just didn’t care at all. He (or she) looked at that and then look the other way. So did the person who installed this slide into the MoHo. Wow. That takes a pretty coordinated set of apathy and low quality standards. I called Fleetwood who is going to let me know if they think the dealer can fix it or if I have to take it to one of the factory service centers (likely in Oregon). This screw might have been the immediate source of our problems. We’ll know next week once La Mesa has a chance to look at it again. I owe Matthew Kelly, my service advisor, a nice bottle of Scotch. But for now, I will have to put the slides in if it is going to rain. So it rained today. At times, it was pretty intense, while at other times, it just poured. Unfortunately, the rain turned to leaks. We found out that the vinyl over our stovetop had a small tear, which then allowed the water to start dripping. There was quite a lot of it. We eventually drained about 5 cups out of the cabinets. Not good. And boy did we find a couple. Fortunately, the record-setting heat (77 degrees, beat the old record of 68 degrees by a huge margin) meant we need to switch from the furnaces to the air conditioning. So we fired up the AC units and …. it half worked. The rear AC unit worked fine, but the front AC was completely dead. I tried all the usual troubleshooting, like flipping the breakers back and forth, but nothing worked. So I called La Mesa and Matthew (who is quickly becoming my favorite person) told me to bring it in. La Mesa service has been awesome by the way. Alex came out and started checking the system. The circuit breakers had power, so that wasn’t it. Then he went on the roof to check the AC unit itself. This is what they look like with the cover off. Want to know something cool? Even though these are small, they are 15,000 BTU of cooling capacity. Each. But back to the story. 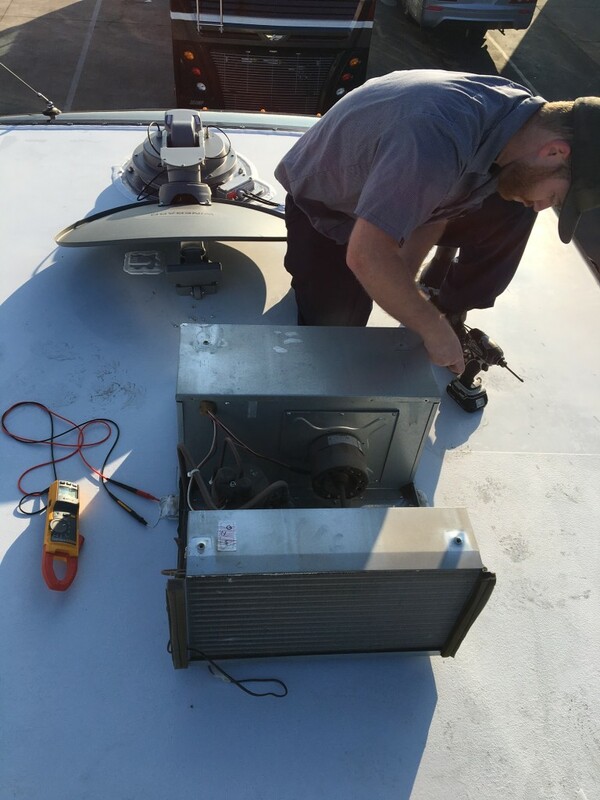 The roof AC looked fine, and everything pointed to an electrical problem. Which can be notoriously difficult to isolate. Alex next checked the control board and as soon as he unscrewed it from the mount the front AC fired up!! Aha, a loose connection! He checked all the connections into the control box, and even redid some of the wires and wire nuts. But as soon as we turned the power back on, no AC. Back to the multi tester we went. Alex found that the main power wire to the AC (which is energized by the control board) had power on one side of a connector and none on the other. He found it!! Its the part circled above. Turns out the female connectors were too loose and were making intermittent (or no) contact with the male pins. Man, this is the kind of intermittent issue that can make a person crazy! We’re very luck it went out and stayed out long enough to diagnose. Instead of what could have happened, which is it worked sometimes based on road vibrations and we never could chase down the problem! Now we are all fixed up and back on the road! Today is driving school day! We are very excited! A little nervous, but mostly excited. But, ya gotta learn sometime, so why not today. Plus, we actually DO have to drive this thing! Ron from Gold Country Driving School was our instructor. He arrived promptly at 9:00am and spent some time talking to us about our goals for the MoHo. What kind of driving were we going to do? Where were we going to go? How long would we be on the road? 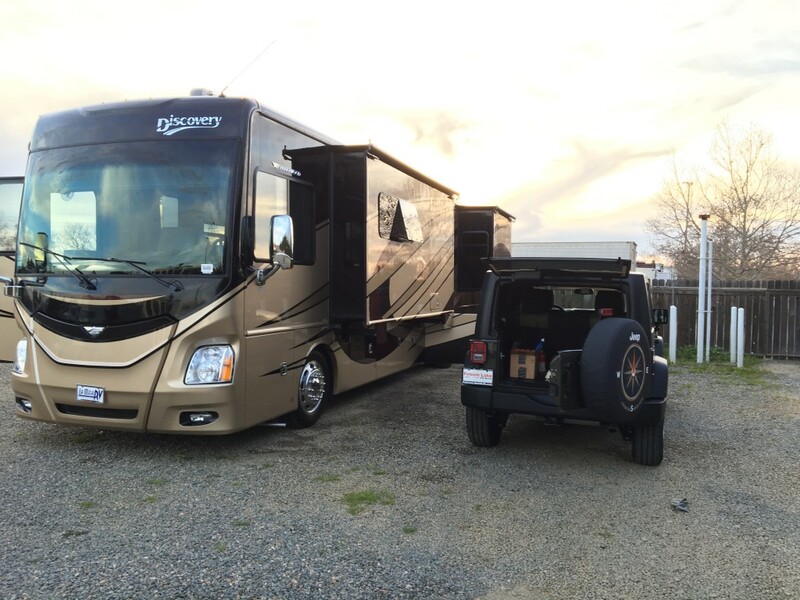 Would we be staying at RV Parks? Campgrounds? Dry camping? 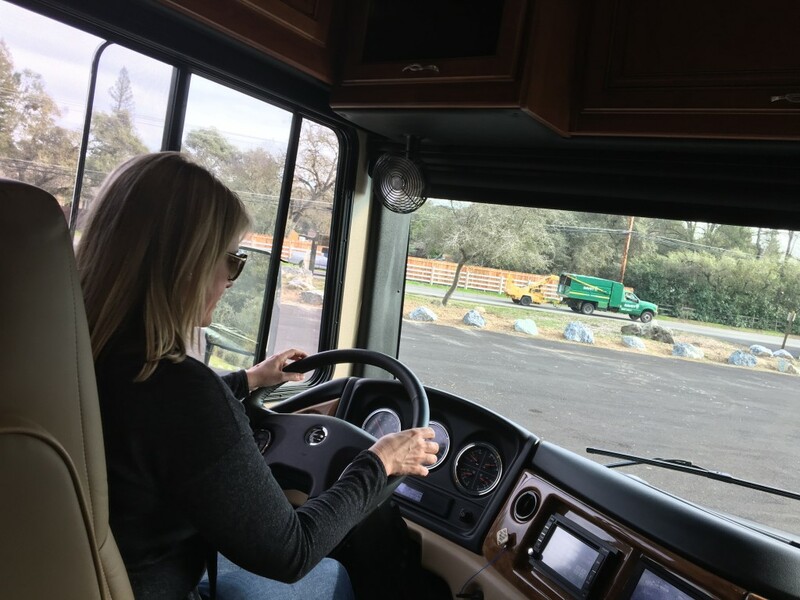 Our answers helped him understand the kind of RV driving we needed to learn. Once he understood our goals, he started out on his orientation of the RV. This was really helpful for us. La Mesa did a walkthrough of the coach, but didn’t really spend a lot of time on the RV part of the RV. They spent a lot more time on the house part of the RV. My guess is that most MoHo buyers don’t just go from nothing to a 39′ diesel pusher but instead sort of move up from smaller travel trailers and Class C’s. Accordingly, they know how the dumping and hooking up works. But we sure don’t! I wanted to have Ron help us dump the tanks so I made sure they were full. The Grey and the black tanks were both full (mostly because I ran plenty of water down both of them). So when we dumped the black tank, it was pretty clear. Still, having a clear elbow in the sewer line was very helpful. You can see Heather’s excitement at dumping the tanks! But it wasn’t so bad. I will say that as we were hooking up, the red sewer hose popped off. Twice. Fortunately we had not started dumping!!!! That would have been NAS-TY. Nasty. Is it possible to get the plague from your own poo? I don’t think so, but I don’t want to find out. We finished our review of the systems inside and outside, and that meant it was time to DRIVE!! Yikes! I started out. Ron gave us very (very) helpful tips on when to start a turn so that you are guaranteed not to hit a curb or a pole on a corner. Apparently this is a very common mistake for novice MoHO drivers, and I was glad for his help. He would help us us by calling out when to start a turn, which help start developing the positioning we need to be successful. He also showed us a neat trick to quickly tell if the MoHo is in the lane without using mirrors. We drove through a mix of traffic locally and then on the freeway and up the Folsom Auburn road. Like delivery day, I didn’t find the MoHo especially hard to drive. Just BIG. And, it doesn’t like sudden moves. So I had to make sure I was making “easy turns.” Which took some practice. Ron had us pull into a small parking lot. He got out some orange cones and spent about an hour helping us practice backing up. Again, not so difficult, but he really drilled home the idea of the rear wheel as pivot point and how important that is. Once I finished backing practice, it was time for Heather to take over! Her first exposure to the MoHo was backing drills! Given the feel of the air brakes, I wasn’t sure how she would do – and she wasn’t either! But she jumped in and did great!! In fact, she ended up driving us from the gas station at Loomis all the way back down to Cal Expo in rush hour traffic. She even backed up the RV and put it into the camp site when we returned!! All in all, I think we both did well. We were both happy that we paid to have the driving instructor. It is both a confidence-booster as well as cheaper than an insurance deductible! Two identical Discoveries being delivered! Delivery day is here! LaMesa pushed the delivery time back from 10:00am to 12:00pm because they were backed up with multiple deliveries. Who would have thought that they were delivering two (nearly) identical Fleetwood Discoveries on the same day at the same time?!?! In the rather smashing “Times Square” paint scheme, I might add! Ours is on the left, by the way. Its the 37r, and is a bit shorter than the 40g on the right. Our generator slide out tray is slightly open in this picture. Delivery was supposed to take 2 hours but it ended up taking 4. Some of the delay was due to the mystery of the hot water. Or lack thereof. I’ll spare you the details, but since this was a new coach, the hot water tank had been in “bypass” mode meaning it was never filled. It took us a while to figure that out. And then more time to turn off the bypass and fill the tank and then wait for water to get hot. Anyway, there are a LOT of systems to go over. But it makes sense. Its a combination house and commercial vehicle all built into one. And all the stuff you take for granted in your house take some thought in the MoHo. Like there are at least 3 ways to get power (your house batteries and inverter, your generator, and shore power). There are 2 separate propane furnaces plus an electric heat pump. Water heater can run on gas or electric (or be off completely). Water supply can come from the fresh tank (activate the water pump), or the city water. 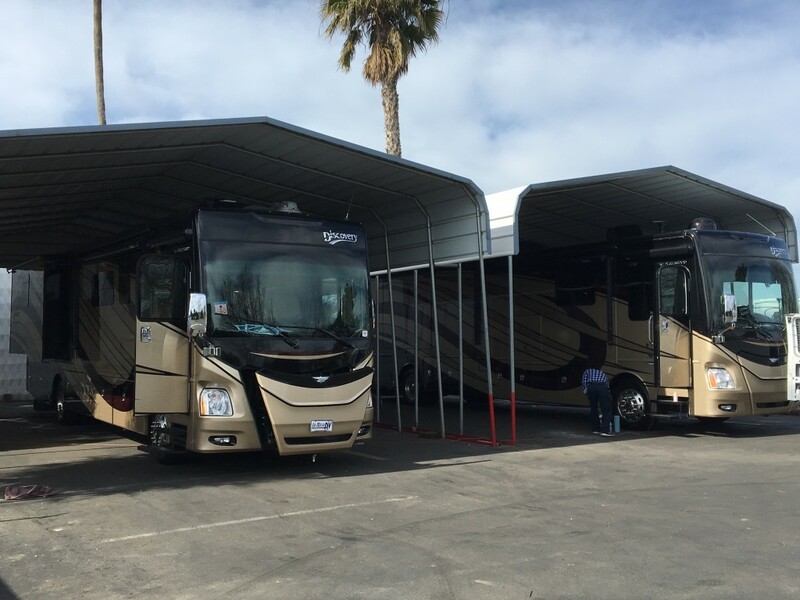 Having never done any RV’ing before, it was ALL new to us. I’m sure in a month it will be second nature. We spent a lot of time going over the AV systems. 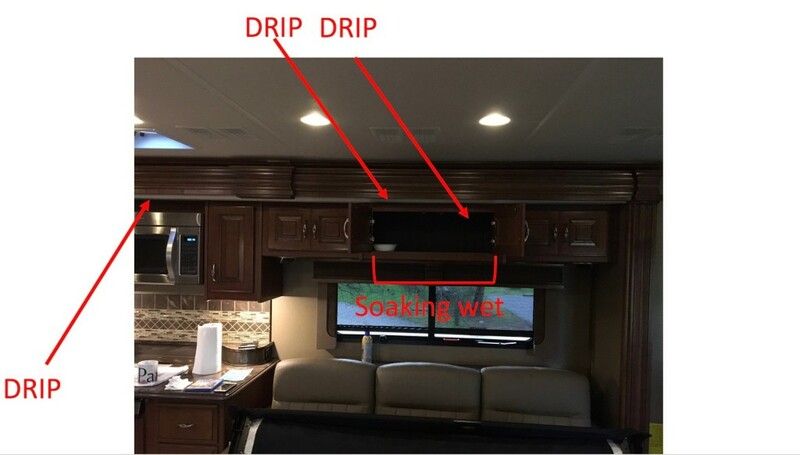 I’m sure that most RV’ers know the RV systems and struggle with how to make the TV and Audio work (and it is complicated). But for me, its the exact opposite. I am not worried about how to make the TVs work, but really did want to know about all the systems and controls. Ken, the delivery guy, was very patient with us (and we were patient with Ken a few times as he tried to figure out the Sony TV). He didn’t mind the stream of questions and made sure we understood everything. Matthew, our service advisor, was great too! He made sure a few items that got missed in the PDI were fixed on the spot. Nothing major, but a few lights that didn’t work, and some other minor stuff. All in all, other than it taking a lot longer than I expected, I was happy with the treatment from LaMesa! I was pretty nervous about driving from Davis to CalExpo RV park at 4:15pm, and sure enough we were right in the middle of rush hour traffic! Still, it wasn’t as bad as I expected. Or as hard to drive. Its really, really big though. That’s the main thing. You can’t just turn like a normal car. In fact, the front wheels are actually directly under (or slightly behind) the driver seat. So you go much further forward that you are used to going in a passenger car. Traffic wasn’t as impossible as I imagined. What I found is that I had to put on my turn signal and just kind of wait a little, then start slowly moving into the new lane. Keep in mind, traffic was crawling. The cars really didn’t have much of a choice except to let me in. Still, I was pretty relieved as we pulled into the RV park. We even got a nice back in spot that is out in the corner with a straight back in. Easy peasy. Even I could do it. Hookups were pretty simple, although I didn’t attach the sewer line yet. No need to do it immediately, and it was getting dark. Author bryanPosted on February 11, 2016 February 11, 2016 Leave a comment on MoHo Delivery day! The whole point of the MoHo is to see new cool stuff. Preferably outdoors. But it does rain some days. And other days, you just want to watch a good movie. Which means TV. And in a MoHo, that basically means satellite. Sure, some campgrounds have cable hookups, but its pretty basic and not very dependable. Cable isn’t an option at all when boon docking. So this is definitely one of those first world problems. But hey, its a problem nonetheless. I had assumed that this was a simple problem, but it turned out to be more complex than I imagined. The first thing I learned is that each satellite network uses multiple satellites. Let’s say 3. The real answer is more complex, but let’s just stick with 3. Some channels are on one satellite, and some channels are on another, some are on the 3rd. DirecTV further complicates the situation by putting its HD channels on a specific satellite frequency requiring a full-size dish. More on that in a minute. Actually, a little more now. If you want DirecTV AND you want HD, your choices are limited quite a bit. #1 – The first is a dome-type dish like the King Tailgater. These are small dishes under a plastic bubble that mounts to the roof of the MoHo. When you get where you are going, you hit a button and the dish automatically finds a satellite and locks on. They are about the same height as the roof air conditioners so they don’t increase the MoHo height. They aren’t impacted by high winds at the campsite if a storm blows in. 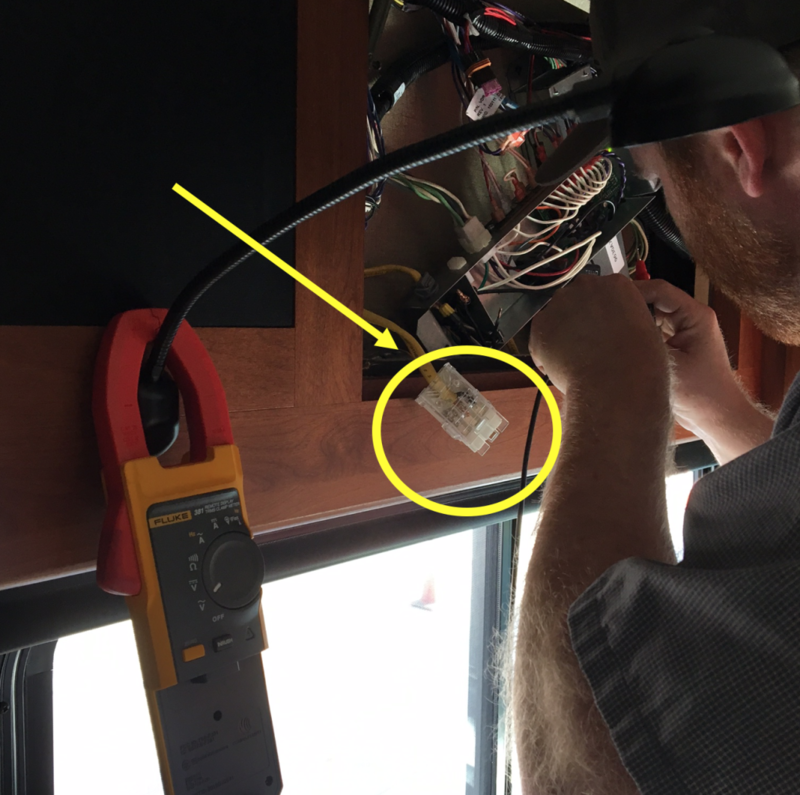 They also get their power directly through the coax lines from the receiver box(es) inside the coach, so there isn’t much to install in the RV. The are around $350 and about the same to have installed. They look pretty cool too! You see these on a lot of motorhomes and travel trailers. Seems perfect right? Well, not so fast. Unfortunately, these are capable of pointing at a single satellite at a time. Say what? Who cares! I’m not an astronaut! Why would I need more than one satellite at a time? Well, To start, if there are two people trying to watch two different channels, and the channels are on different satellites, then one person doesn’t get to watch what they want. (aside: between Heather and I, I’m pretty sure I know who that would be – Home and Garden TV beats History Channel every time in our house). Next, the DVR may or may not work reliably if it is trying to record a show on a channel carried by a different satellite than the one the dish is currently pointed at when the recording is supposed to start. Some reviews have complained that the dish itself makes a lot of noise during channel surfing as it repositions to point at one satellite or another. Others say they don’t notice. Given the relative age of many of the target customers, the difference in perceived volume might not be equipment-related, if you get my drift. The size of the dish is another concern…it is smaller than the standard dish and so signal strength will always be lower vs. a traditional full size dish. Not a big deal in a clear sky, but lots of RV parks have trees, and thunderstorms could definitely rain on your parade. Lastly, these are not capable of getting DirectTV HD. Not at all. You’re stuck with Dish Network (which is fine for most people) if you use a dome and want HD. So what options DO exist for more traditional Full Service satellite TV? Inquiring TV junkies want to know! This bad boy is a collapsible full-size dish that can lock onto 3 satellites at once and will provide the same experience you get at home. Full DVR. Full HD (both DirecT and Dish Network). Full signal strength. So what’s the downside? COST! Well, that, and if you drive off with it still raised, you can rip a huge hole in your roof and cause thousands of dollars in damage. Remember your preflight checklist, people. Its also takes about 5 minutes to start up and shut down so its not quite as fast as the dome-type dishes but this is not a big deal. This unit is obviously subject to high winds if a storm blows in. The manufacturer says its good for winds up to 70mph, and while I don’t doubt that, I am not sure what the stress on the MoHo roof structure would be. I will probably lower the dish if I am in winds over 40mph. (incidentally, a Winegard engineer posted on IRV2 that 40mph would be his top limit too, and the official limits were higher than he would be comfortable with). So, this is something to keep in mind vs. the dome-type dish. If the winds come up, pop in a DVD. There is a 3rd option that I said I wasn’t going to talk as much about. These are ‘in-motion” dishes which let you view satellite TV while driving down the road. They are basically a specialized version of #1 – the Dome – that has a wider angle view of the sky as accordingly, can (more or less) keep at least one satellite in view as you go down the road. There are plenty of limits, and it mostly works on the interstates (flat, no trees), won’t work in canyons, etc. At first I thought this was a total gimmick, especially since I don’t have kids to keep entertained. Tagline: In-motion dishes, replacing “are we there yet” with “let it go, let it gooooooo” since 2007 (when did “Frozen” come out?). This option is about halfway between the dome price and the Winegard Trav’ler. And in terms of capability, its essentially the same as the standard dome. Like no DirecTV HD signals on this kind of dish and only on satellite at a time with either Dish Network or DirecTV. But it could be handy to make sure scheduled DVR recordings actually happen, even if you are causing along HWY 15 in the middle of nowhere. At least in standard def. I didn’t look much into this option as its pretty expensive for the limited extra ability, but it might be perfect for you. Next blog will be about choosing DirecTV or Dish Network. Because we haven’t picked providers or receivers yet. 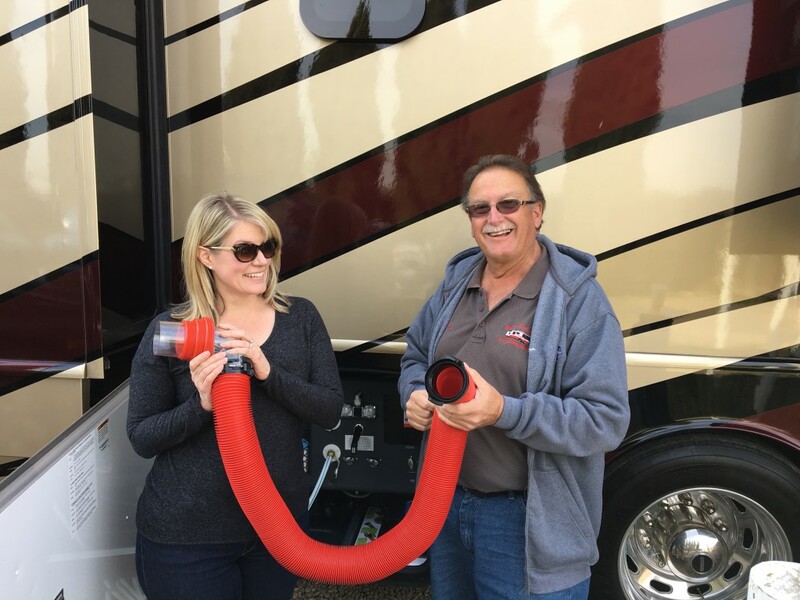 We arrived at La Mesa RV in Davis, CA to inspect the MoHo today! Now, anyone who knows me knows I am a car nut (ahem…”enthusiast”). And I’ve inspected more than my fair share of cars. 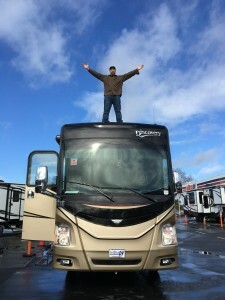 But inspecting an RV is a completely different beast. Fortunately, my stepdad Rex, a full-time RV’er and VERY thorough guy, flew out to help! He had an 8 page checklist that we followed covering the insides, the outsides, the basement, the appliances, the windows, the leveling jacks, the plumbing, the lighting, the generator, the furnace/ac, the batteries, the slide outs, the water heater, the gauges, etc. Man, what a list! It took a full 2 hours to go through the coach. I felt much better having done such a thorough inspection. We found a few items, nothing really major. Fortunately, it was kind of raining and we discovered the passenger side window leaked and needed a new gasket. We would have missed that if it had been dry – as it was just a few hours later. Otherwise, one of the windows was stuck, a slide out was making a really loud screeching noise (needed lube), several lights were out (one inside and three outside), there was a missing cover for the wet bay, there were burned out LED lights on the “angel eyes” headlight trim rings, and there was a minor spiderweb crack in the shower. That sounds like a lot, but trust me, it isn’t much. And none of it was especially serious. Of course, I couldn’t resist hamming it up on top of the MoHo as we checked out the roof! 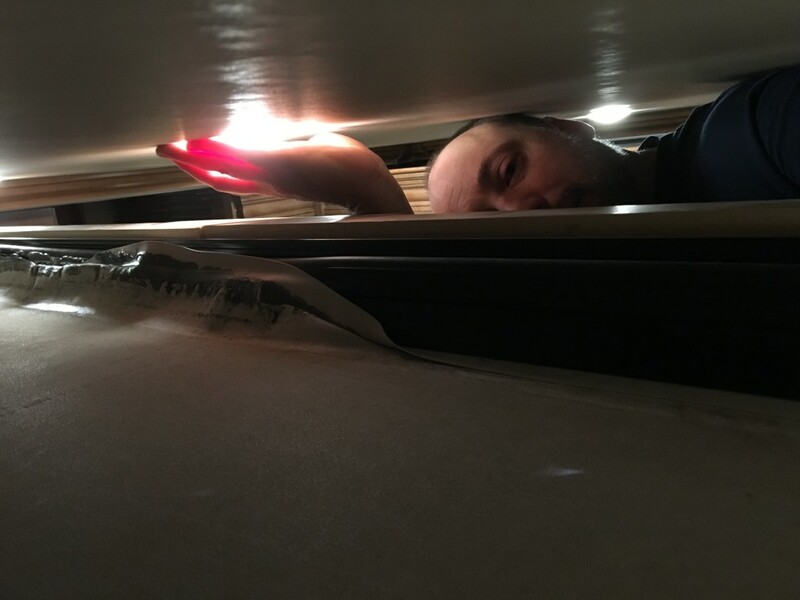 Author bryanPosted on January 23, 2016 February 17, 2016 Leave a comment on Inspection today! Its happening! Years of planning, counting, measuring, reading, reviewing, discussing, shopping, preparing have lead to this! And yes, stressing, worrying, questioning, second-guessing too. Its all part of preparing to ….. Author bryanPosted on January 17, 2016 January 17, 2016 Leave a comment on Live MoHo is born!